Malocclusion may be remedied by orthodontic treatment; orthodontics is a specialty of dentistry that manages the growth and correction of dental and facial structures. Braces are the most commonly used orthodontic appliances in the treatment of mal-occlusion. At any given time, approximately 4 million people in the United States are wearing braces, including 800,000 adults. Braces apply constant gentle force to slowly change the position of the teeth, straightening them and properly aligning them with the opposing teeth. Braces consist of brackets cemented to the surface of each tooth and wires of stainless steel or nickel titanium alloy. When the wires are threaded through the brackets, they exert pressure against the teeth, causing them to move gradually. Braces are not removable for daily tooth brushing, so the patient must be especially diligent about keeping the mouth clean and removing food particles which become easily trapped, to prevent tooth decay. Foods that are crunchy should be avoided to minimize the risk of breaking the appliance. Hard fruits, vege-tables, and breads must be cut into bite-sized pieces before eating. Foods that are sticky, including chewing gum, should be avoided because they may pull off the brackets or weaken the cement. Carbonated beverages may also weaken the cement, as well as contribute to tooth decay. Teeth should be brushed immediately after eating sweet foods. Special floss threaders are available to make flossing easier. Depending on the cause and severity of the mal-occlusion and the appliance used in treatment, a patient may expect correction of the condition to take 2 or more years. Patients typically wear braces 18-24 months and a retainer for another year. Treatment is faster and more successful in children and teens whose teeth and bones are still developing. The length of treatment time is also affected by how well the patient follows orthodontic instructions. American Association of Orthodontists. 401 North Lindbergh Boulevard, St. Louis, MO 63141-7816. (314) 993-1700. http://www.aaortho.org. Braces — An orthodontic appliance consisting or brackets cemented to the surface of each tooth and wires of stainless steel or nickel titanium alloy. Braces are used to treat malocclusion by changing the position of the teeth. Impression — An imprint of the upper or lower teeth made in a pliable material that sets. When this material has hardened, it may be filled with plaster, plastic, or artificial stone to make an exact model of the teeth. Occlusion — The way the upper and lower teeth fit together in biting or chewing. Retainer — An orthodontic appliance that is worn to stabilize teeth in a new position. Space maintainer — An orthodontic appliance that is worn to prevent adjacent teeth from moving into the space left by an unerupted or prematurely lost tooth. malposition of the teeth resulting in the faulty meeting of the teeth or jaws. The condition should be corrected because it predisposes to dental caries, may lead to digestive disorders and inadequate nutrition because of difficulty in chewing, and can cause serious psychologic effects if there is facial distortion. Corrective treatment is provided by an orthodontist, who may apply appropriate dental appliances to improve the position of the teeth. 1. Any deviation from a physiologically acceptable contact of opposing dentitions. 2. Any deviation from a normal occlusion. /mal·oc·clu·sion/ (-ah-kloo´zhun) improper relations of apposing teeth when the jaws are in contact. 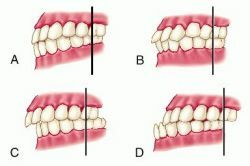 (A), Normal occlusion; (B), Class I malocclusion; (C), Class II malocclusion; (D), Class III malocclusion. Note the position of the mesial cusp of the maxillary molar relative to the mandibular molar in each type of occlusion. 1. Faulty contact between the upper and lower teeth when the jaw is closed. 2. An instance of such faulty contact. abnormal contact between the teeth of the upper jaw and those of the lower jaw. See also Angle's Classification of Malocclusion (modified), occlusion. 2. Any deviation from an ideal occlusion. A poor physical relationship between the biting or grinding surfaces of the teeth of the upper jaw and those of the lower. Malocclusion is readily correctable by ORTHODONTIC TREATMENT. n (relationship of teeth in occlusion), a deviation in intramaxillary and/or intermaxillary relations of teeth that presents a hazard to the individual's oral health. Often associated with other orofacial deformities. Initial classification of cases is usually done by Angle's classification system. See also Angle's classification. n a type of malocclusion occurring in persons who cannot close all their teeth while holding their condyles in the most posterior position. Instead, in closure they first contact one or two pairs of poorly coupled teeth. To gain occlusal contacts of the other teeth, they must move the jaw anteriorly, laterally, or anterolaterally, as the deflectors demand in their guidance. Malocclusion classes as specified by Angle. malposition of the teeth resulting in the faulty meeting of the teeth or jaws. Malocclusion of the incisors is a common defect in all species and is treated as an inherited defect in many of them. See also bite (3), parrot mouth. At 95 % confidence level a statistically significant difference (ANOVA) between Class 1, 2 and 3 malocclusions was observed when wavy (p=0. Although there is evidence that malocclusion is associated with poorer socioeconomic status (4-6), with the presence of dental problems such as caries (7), tooth loss (6,8) and periodontal disease (9), results have been diverse and the association between these aspects and malocclusion is unclear. Self-reported temporomandibular disorder symptoms and severity of malocclusion in prospective orthognathic-surgical patients. Orthognathic treatment for correction of Class II malocclusions has an influence on the perception of social characteristics. The study involved 15 patients (7 boys and 8 girls) with skeletal Class II Division 1 malocclusion due to mandibular retrognathism with a mean age of (10. All the three classes of occlusion (Class I, Class II and Class III) of skeletal and dental malocclusion were also included in the sample. Prevalence of malocclusions and demand for orthodontic treatment among students at a women's high school [in Japanese]. The aim of this report was to present the camouflage treatment of a patient with skeletal Class II malocclusion and lower crowding for whom one mandibular incisor extraction was selected as the treatment of choice to improve the dental occlusion. Arntsen and Sonnesen  also found an increased head extension in the patients with class II malocclusion. 21] conducted a study in Italy, aimed at determining the correlation between otitis media and malocclusions in children. Individuals were selected based on the following criteria: Class II facial pattern associated with mandibular retrusion, Class II division 1 malocclusion, mixed dentition, absence of severe crowding in mandibular arch and transverse problems. The fixed braces market holds the largest market share in 2015, owing to the better affordability of fixed braces over removable braces, high prevalence of patients with malocclusions and jaw disease, and increased adoption of fixed braces among adolescents.